I was really hoping that BLISS’s new Poetic Waxing Wax Strips Face would work on eyebrows but sigh, they don’t. Not because they don’t work but they are not made for brows. These strips are made for the face fuzz above the lip, chin and worked well on the fuzz hanging out on my lower jaw. And it’s super easy and doesn’t hurt. Just grab one of the 2” x ½” hypoallergenic and paraben-free strip, warm it in your hands for 15 to 30 seconds, peel the two halves apart and apply one strip to the skin. Then massage it on there and pull skin taut. Make sure to pull the strip off quickly in the opposite direction of the hair growth. And you can reuse the strip until it’s covered in hair and has lost its stickiness. They even include a oil called azulene oil to help soothe the newly waxed area and it also helps remove any wax that may have stuck to the skin. Happy waxing! $10/10 facial waxing strips, $20/20 facial waxing strips @ kohls.com. Think of the scents orange and white pepper. Doesn’t seem very pleasant and that you’d just be sneezing a lot but they seemed to balance the ingredients outs perfectly to come up with a winning combo. BLISS Blood Orange + White Pepper scents is rocked in a Body Butter ($35/8.5oz), Bath + Shower Gel ($24/8.5oz), and Sugar Scrub ($36/11oz) so you have a nice choice. Still need it broken down? Think of blood orange mixted with top notes of coriander and white musk. So you're first greeted with the top notes and left with a familiar orange citrus. Totally comforting. And this scent won their own ‘eau’ lection in 2008. 40,000+ votes can’t be wrong! All @ blissworld.com. 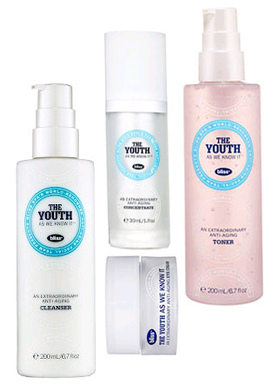 We loved The Youth As We Know It Moisturizing Cream when it came out last year and yeah, they’ve expanded the collection! I don’t think much will get by when you have this 5some on hand from BLISS. First up, we got the creamy The Youth As We Know It Cleanser ($30/6.7oz) and the The Youth As We Know It Toner ($28/6.7oz). There’s been much debate on whether or not the skin even needs a toner. I vote yes as I’ve read a few places that it resets the pH of the skin. I really like this next product in the collection called The Youth As We Know It Concentrate: Age Control ($70/1oz). This serum claims to release moisturizers two different times in the day. Wow! I guess I have to believe them since I couldn’t see it on my skin but I know my face did not seem dried out when I went to wash it at bedtime. I happen to be a naturally pale girl with a love for the bronzed look. So, one could say that I’m a big fan of self-tanners. I have tried almost all of them searching for the ideal consistency, even fading, with a flawless natural look. This new one from BLISS, A Tan For All Seasons ($34/4.40z @ blissworld.com), is one of the closest products I’ve used to obtain the ideal tint. The first thing I noticed was the color of the product right out of the can. Most self-tanners have an orange hue to its product, giving your skin a final output of that orangey look, which screams “tan out of a can”. This one comes out of the can with a purple tint, which at first made me nervous, but ended up drying to a warm, brown bronze. I loved the easy to spray method with its instant color to help create flawless coverage. Another quality I look for in a self tanner is the final color staying on your skin and not seeping onto your clothing. This product dries quickly and didn’t budge thorough out the day! My only warning with this product is to make sure that you wash your hands as quickly as possible or use gloves because it took about 3 washes with scrubber to get the color completely off the inside of my hands. My end thought was, I found my new self tanner, and as they say, it’s sun-believable. 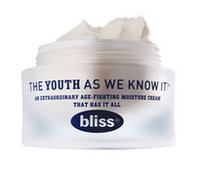 BLISS’ new The Youth As We Know It ($79/1.7oz @ dermstore.com) is everything you want in an anti-aging cream and more. Really. It has the 10 major categories covered - from wrinkle relaxers to hydration. Just think of anything you could ever want a moisturizer to do and this one does it. I could go on and on about the ingredients inside but let’s face it, you want the bottom line, right? Go out and get it!